Windows 10 Firewall Control takes over the control of all the installed applications network activity. Windows 10 Firewall Control detects any connection attempt and can allow the connection or block the attempt. So, there can be no network traffic passed without your explicit permissions or an evident notice. Windows 10 Firewall Control provides with complete, exhaustive and friendly network access control and monitoring. You can set appropriate network permissions to any application nearly with a single click, can supervise the results and can change the permissions anytime. Windows 10 Firewall Control includes a list of network active programs. Any listed program is set with a security zone, i.e. a set of network permissive/prohibitive rules. The zones are friendly named. There is no need to be a network security expert to choose the proper zone. 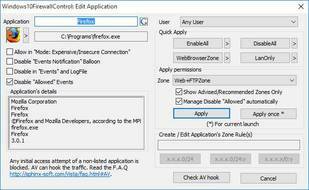 For instance, if you have a listed program, the program is known to you, you trust the program and you need the program's network activity, you set the program with EnableAll zone, so you allow the program passing to the network without limitations. If you have a doubt regarding the program, hesitate the program activity is required, you set the program with DisableAll. Thus all the program's network activity will be suppressed. The elder Editions include 30+ predefined zones applicable with a single click. For instance, the LanOnly zone allows a program to communicate with your local network only and prevents any communications from/to outside. The WeBrowser zone provides with unrestricted web surfing and prohibits any other types of connections. The permissions can be changed anytime, if you reconsider the need of a program's network activity. Instant traffic notifications help you to verify the permissions are correct or assist reconsidering the permissions, if something goes wrong. The programs list is empty after the installation. Windows 10 Firewall Contol starts detecting network active programs. 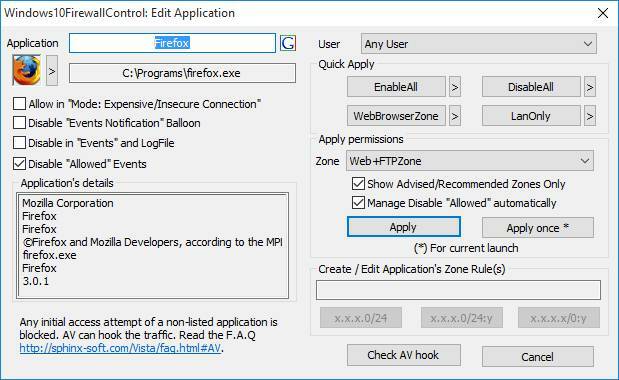 If a program makes an incoming/outgoing connection attempt, Windows 10 Firewall Control blocks the attempt first and prompts you to choose the proper network permissions with the Edit Application dialog. The Zone Adviser determines the program type and helps you choose the proper security zone. You can just confirm the advised permissions are correct or choose the default zone by canceling the prompt. The default zone is restricted typically, but the zone is safe from the network point. The permissions can be changed later anytime. After a program is listed, Windows 10 Firewall Control will just use the permission set to the program and will not disturb you in connection with the program anymore. Windows 10 Firewall Control shows the network events notifications. The event text is pretty descriptive. The text includes the program name, the network access result (blocked or allowed), the network access direction (incoming or outgoing), the connection target point (IP address, IP port, protocol name) and the zone/rule name made such network result. So, you are up to date about all the network programs requests and the connections results. After launching Windows 10 Firewall Control the icon appears on Task Bar. Clicking the icon opens the main program interface. Another icon is inserted into System Tray (next to the clock usually). The System Tray icon may be blocked by Windows. Windows keeps quantity of displayed icons minimal to manage the screen space, but you can manage the System Tray icon appearance yourself easily. 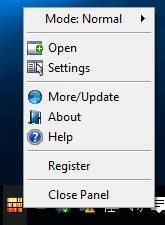 Right clicking the System Tray icon offers more quickly accessible options. Mode: EnableUnknown - Enables all the listed programs and allows the listed applications to follow the applied permissions. All the unknown (unlisted yet) applications will be unconditionally enabled. The mode is useful as a workaround while installing new applications that can not suffer initial/detection blocking. New applications will not be detected/listed while using the mode. Mode: Enable/DetectUnknown - The mode is similar to the mode above, but the new (unlisted yet) applications will be detected and listed. The initial/detection blocking will not be applied though. Mode: LanOnly - The mode allows connections to/from LAN only for all applications. All the other connections will be disabled. New (unlisted yet) applications will be detected as usual. Mode: EnableAll is very useful to diagnose any connectivity problem. Setting the mode switches the firewall off entirely. So if a program is overblocked, you can (temporary) set Mode:EnableAll and verify the connectivity. If the problem remain in Mode:EnableAll, the problem is caused by another program (WindowsFirewall, Antivirus, etc) or by temporary internet connection unavailability. If there is no problem in Mode:EnableAll, but Mode:Normal blocks a program still, the problem is caused by incorrect network permissions (security zone) set to the program. You can trace the event notifications to determine the incorrect zone/rule or set the program with EnableAll to permit the program worldwide at once. Windows 10 Firewall Control allows programs network access control directly from the desktop with the context menu.